Another week, another shameful secret here at Reader Dad: The Cut – the first book in a new series featuring private investigator Spero Lucas – is the first George Pelecanos book I’ve read. With that out of the way, let’s get on with the review. Spero Lucas is an ex-Marine, a veteran of Gulf War II who spent most of his tour fighting insurgents in Fallujah, and currently works as an unlicensed investigator in Washington, D.C. Most of the work he does is commissioned by Tom Peterson, a high-powered lawyer who will use any loophole he can find to help his clients beat a guilty verdict. One such job brings him into contact with Anwan Hawkins, a high-profile marijuana dealer currently in prison. Hawkins hires Lucas to find and return a number of packages that have been stolen from his dealers, or retrieve any proceeds made from their sale. What starts out as a simple piece of work soon turns sour, and Lucas finds himself embroiled in murder, kidnapping, crooked cops and psychopathic assassins. Spero Lucas is an interesting character: he’s part of a large Greek family, most of whom – himself included – were adopted and renamed by their new parents. His father has recently died, and Spero seems not to be coping too well: ‘You go to the graveyard more often than you go to see Mom’ his brother tells him. Despite that, he’s a loving brother and son, and a devout and practicing member of the Greek Orthodox Church. But there’s another side to Lucas: Spero Lucas at work. Here we see a darker soul, a troubled man who has seen more than his share of killing, and who has issues getting it off his chest, even with the men with whom he served. He’s an unlicensed investigator who operates on the fine line between legal and not. There are scenes in The Cut which will make you question whether or not you like this man. The Cut is a lean (just over two-hundred pages), fast-paced thriller told in language that is almost lyrical. Pelecanos has an encyclopaedic knowledge of DC and the people who live there, how they speak and how they act. This is a city filled with racial tension in which Lucas – a white man with a black brother – seems to be the only colour-blind person. It is at once an edge-of-the-seat crime novel and an examination of a man who has served his country in a foreign war, and is now trying to adjust to life back in his home town, the relationships he forges, and those he fails to forge, and how he can exist as, effectively, two separate people. With a supporting cast of characters who could each carry a novel of two of their own, The Cut is a fun ride with a very dark undertone. Spero Lucas will return, and we can only hope that Pelecanos sticks to what proves to be a successful formula: short and sharp, dark, exciting and beautifully written. 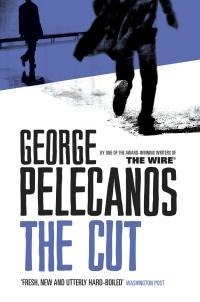 If you’re a fan of The Wire – for which Pelecanos wrote – or a fan of old-fashioned crime fiction – I’m thinking Chandler, Hammett, Stark – then The Cut is definitely one for you. I loved this. Pelecanos is an auto-buy for me. Also Joseph Wambaugh, Michael Connelly, James Lee Burke, James Ellroy. Class acts all.